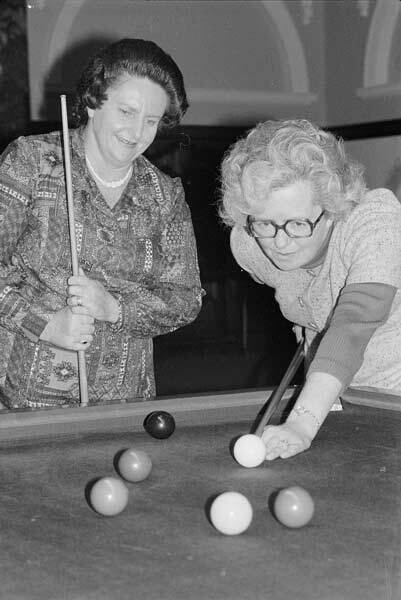 Dorothy Jelicich (left), shown here playing pool with fellow member of Parliament Mary Batchelor at Parliament in May 1975, is difficult to categorise in class terms and illustrates the problems of making such judgements. Her mother had a solid middle-class background; her father was a semi-skilled labourer. Her husband was a bricklayer, and with family support she opened a restaurant in Papatoetoe. At that stage her husband's occupation would have defined her as working class, but her own occupation defined her as a middle-class employer and owner. In 1964 she and her husband bought a small dairy farm in Bombay, south of Auckland, and they both became farmers. In 1970 she returned to the city as manager of a shoe store, and then left that role to become a union organiser. Soon after, in 1972, she was elected to Parliament as a member of the Labour Party, the voice of the working class. So whether she could be described as working class or a member of the employing middle class depends on what period of her life is examined, and whether her whole family situation and subjective identity are considered. Certainly she would have described her loyalty as being to working people.